Cooling off for the summer: my alpacas are ready for shearing! June is the month my alpacas get to lose their warm winter coats ready for all the lovely weather we hope is coming our way. Family planning at the Alpaca Futurity Show! As an alpaca breeder, the sector’s shows are of great interest to me, and I love to admire the top quality stud animals available and do some “family planning” for my breeding females. 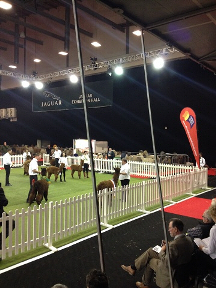 This year I went to the Alpaca Futurity show in Coventry (which champions the best of British alpaca breeding) along with a couple of other Shropshire-based alpaca breeders. While we were there we had a meeting with one of the UK’s top breeders, Toft Alpacas. One of their stud males, Toft Timogen (pictured at the front), was best in show for browns and I think he would be a wonderful choice as the sire for next year’s baby alpacas (cria). I am now waiting to hear how much it will cost to use this handsome stud after his success in the show, so watch this space! I love all of my alpacas, and I’m always intrigued to get to know each one, as they all have their own individual personalities. is a pure white female who used to be the dominant female in my herd, although she now lives in Italy after selling her a couple of years ago. 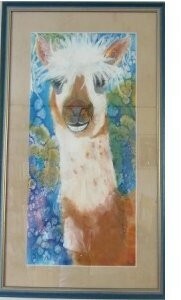 She was a very independent alpaca and a wonderful mum producing lots of little cria for me. I will never forget Sonowdrop’s quizzical expression, as she has now been immortalized for me in a fantastic painting which is hanging on my wall. 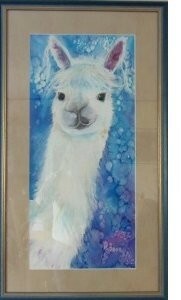 Right next to Snowdrop’s portrait is another painting, and this one is Derby, my fawn and white ‘Alpaca with Attituude’. Derby has the most amazing hairstyle which suits his personality down to the ground. He was quite difficult to halter train, but I perservered, and now he’s as good as gold. Both of these lovely pictures were painted by a neighbour when I was living in Southern France near the Pyrenees. Gill Masters is an artist who had moved from Kiddermisnter out to France, and at one of my open days she mentioned that she loved painting farm animals. I jumped at the chance to have some fantastic artwork on my wall featuring two of my favourites. I was so pleased with the results. Gill is a very talented artist and captured Sonwdrop’s searching look and Derby’s crazy hairstyle perfectly! It’s great to have a gift for painting like Gill, but there lots of other ways to be creative too. I like to see what people can create with my alpaca wool, for example. And I thought it would be a great idea to feature a knitting pattern ( or something similar) on my blog every month. This will be starting next month, so watch this space! This month I’ve got good news for children of all ages, from toddlers right up to young at heart 80 year olds: I have unveiled some beautiful and unique alpaca toys, made from our own alpaca wool. Hi. 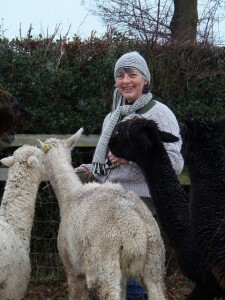 I’m Jane Potts and I’d like to introduce my new blog about life with my herd of gorgeous alpacas! I used to be a farm secretary until I fell in love with this cuter cousin of the llama at the Royal Show in Warwickshire back in 2007. Just one look from fabulous Phoebe and her little friend Eliza was enough to convince me my future lay with these fleecy little bundles of fun. They are the prettiest, fluffiest members of the camel family and are usually sweet tempered and easy to handle. Phoebe and Eliza were pregnant when I bought them, and moved with me to France in 2008, where I bought more female alpacas, increasing my herd to 17. It wasn’t long before I started producing luxurious hand knitted products from their fleece. Known as the “fibre of the gods”, alpaca wool is soft and durable, as fine as cashmere, and almost as strong as silk. The first female cria (baby alpaca) born in France was called Coco, and that’s where the name Coco Alpacas came from. It also seemed appropriate because French fashion designer Coco Chanel was an iconic figure, and alpaca wool is highly prized in the fashion industry.